Private Martin Moffat, Prince of Wales’s Leinster Regiment, unveiled by the Minister for Culture, Heritage and the Gaeltacht Josepha Madigan TD. The ceremony was hosted by the Glasnevin Trust and was attended by dignitaries who were present for the State commemoration marking the centenary of Armistice Day. As part of the Decade of Centenaries, the Commonwealth War Graves Commission, with the support of the Irish Government, has commissioned Commemorative Stones for all 24 recipients of the Victoria Cross during the First World War who were born in the Republic of Ireland. The memorial programme associated with the Commemorative Stones involved a commemoration taking place on the anniversary of the historic action for which each VC was awarded. The Commemorative Stones are part of a unified permanent display at the Cross of Sacrifice in Glasnevin Cemetery, and replica stones are available for local communities of the place of birth of the recipient, (costs accruing to the local community). Information on each of the recipients of the Victoria Cross is outlined below. Of Dutch extraction, Edmund De Wind was born on 11 December 1883 in Railway Street, Comber. He was the youngest son of Arthur Hughes De Wind (born Malacca, Bengal, India) and Margaret Jane De Wind (nee Stone, born Barn Hill, Comber), who were married on 12 April 1863, in St Mary’s Church of Ireland, Comber Parish. For a time, the De Wind family lived in Singapore when Arthur was Commissioner of Public and Municipal Works. They moved back to Comber in 1872. The De Wind family lived in Railway Street, Castle Street and Bridge Street, Comber, thereafter in Kinvara, Killinchy Road, Comber. Arthur De Wind was a railway engineer who worked for a time in India and later as Chief Engineer on the Belfast and County Down Railway. Edmund attended Campbell College before working for the Bank of Ireland in their Belfast and Cavan branches, and later emigrated to Canada. He was working for the Canadian Bank of Commerce in Edmonton when he enlisted into the 31st Battalion (Alberta), Canadian Expeditionary Force on 16 November 1914 with the army number: 71952. He fought with the CEF at St Eloi, Ypres and the Somme. On 29 May 1915, Private Edmund De Wind embarked for England aboard the SS Northland. He went to France on 19 September 1915 with the Machine Gun Section of the 31st Battalion. On 20 March 1917, he transferred to Cadet School with a view to obtaining a commission and on 25 September 1917 he was discharged to a commission with the 17th Battalion The Royal Irish Rifles in Dundalk. Two months later, he was transferred to the 15th Battalion. 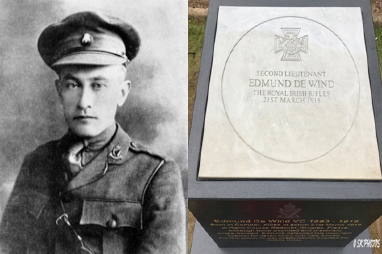 Second Lieutenant De Wind was serving with the 15th Battalion The Royal Irish Rifles in an area to the southwest of St Quentin when the Germans launched Operation Michael, the first and main attack of their spring 1918 offensive. Edmund was killed in action at Grugies, Picardy at the age of 34. At the time of his death he was engaged to be married. His body was never recovered and he is remembered on the Pozieres Memorial at the Somme, panel 74 – 76. An Ulster History Circle Blue Plaque was erected on 14 September 2007 at Bridge Street Link, Comber. Although born on 19 July 1892 at 42 Bexhill Road, Hastings, as Stephen Sargent Claude Nunney, he was generally referred to by his family as Claude. He was the fourth of eight children. In October 1905, Claude, together with his brother Alfred, travelled aboard the SS Tunisian to Quebec. Some time later, they moved to Saint George’s Home in Ottawa. At the age of thirteen, Claude was placed with Mrs Donald Roy McDonald, where he lived and worked as a “Home Child”. The term “Home Child” covered the young girls and boys sent as child emigrants by various agencies to Canada to start new lives. On the 8 February 1915, Claude Nunney attended the Drill Hall, Alexandria, Glengarry County and enlisted in the Ottawa Overseas Battalion (Eastern Ontario Regiment, part of the 38th Canadian Expeditionary Force (CEF). He re-attested on 08 March 1915, giving his place of birth as Dublin. The 38th CEF served in Bermuda from 12 August 1915 until 30 May 1916. The unit landed in France on 13 August 1916, as a component of the 12th Canadian Infantry Brigade of the 4th Canadian Division. Pte Nunney was wounded on 12 April 1917, on 29 July 1917 and on 3 May 1918. He was recommended for the Distinguished Conduct Medal on 17 April 1917 and the Military Medal on 3 July 1917. For most conspicuous bravery during the operations against the Drocourt-Queant Line on September 1st and 2nd, 1918. On Sept. 1st, when his battalion was in the vicinity of Vis-en-Artois, preparatory to the advance, the enemy laid down a heavy barrage and counter-attacked. Pte. Nunney, who was at this time at company headquarters, immediately on his own initiative proceeded through the barrage to the company outpost lines, going from post to post and encouraging the men by his own fearless example. The enemy were repulsed and a critical situation was saved. During the attack on Sept. 2nd, his dash continually placed him in advance of his companions, and his fearless example undoubtedly helped greatly to carry the company forward to its objectives. When his battalion which was preparing to advance, was heavily counter-attacked by the enemy, Private Nunney on his own initiative, went forward through the barrage to the company out-post lines, going from post to post and encouraging the men by his own fearless example. 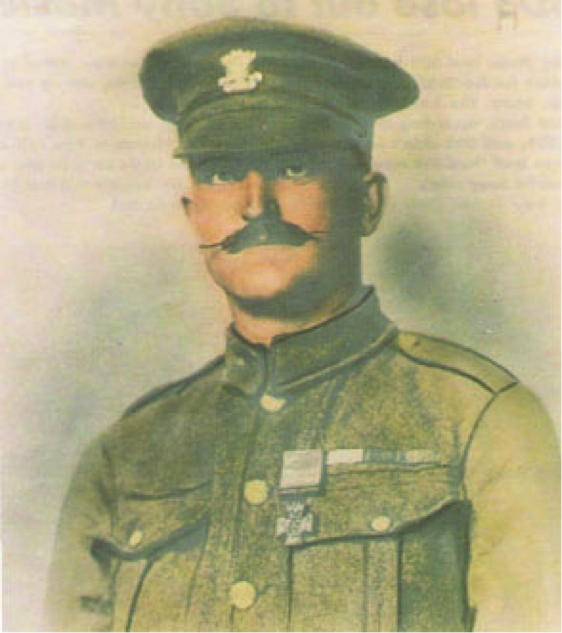 Private Nunney VC died on 18 September after receiving what proved to be mortal wounds. He was buried at Aubigny Communal Cemetery Extension, (Grave reference number IV. B.39). Private Nunney was the mostly highly decorated of the enlisted personnel serving in the Canadian Army during the First World War, being the only Canadian soldier of the war to be awarded the Victoria Cross, Distinguished Conduct Medal, and Military Medal. He was he 38th CEF’s second and final recipient of the Victoria Cross. Private Nunney’s Military Medal, Distinguished Conduct Medal and Victoria Cross are on display in the Cornwall Armoury, Ontario. Martin Doyle was born in Gusserane, New Ross on 25 October 1891. In 1909, he enlisted in the Royal Irish Regiment in Kilkenny and deployed to India. In September 1918, whilst serving with the 1st Battalion, The Royal Munster Fusiliers, 16 (Irish) Division, Company Sergeant-Major Doyle was awarded the Victoria Cross. For most conspicuous bravery on the 2nd September, 1918, near Riencourt, when as Acting Company Serjeant-Major, command of the company devolved upon him consequent on officer casualties. Observing that some of our men were surrounded by the enemy, he led a party to their assistance, and by skill and leadership worked his way along the trenches, killed several of the enemy and extricated the party, carrying back, under heavy fire, a wounded officer to a place of safety. Later, seeing a Tank in difficulties, he rushed forward under intense fire, routed the enemy who were attempting to get into it, and prevented the advance of another enemy party collecting for a further attack on the Tank. An enemy machine gun now opened on the Tank at close range, rendering it impossible to get the wounded away, whereupon C.S.M. Doyle, with great gallantry, rushed forward, and, single-handed, silenced the machine gun, capturing it with three prisoners. He then carried a wounded man to safety under very heavy fire. Later in the day, when the enemy counterattacked his position, he showed great power of command, driving back the enemy and capturing many prisoners. Throughout the whole of these operations C.S.M. 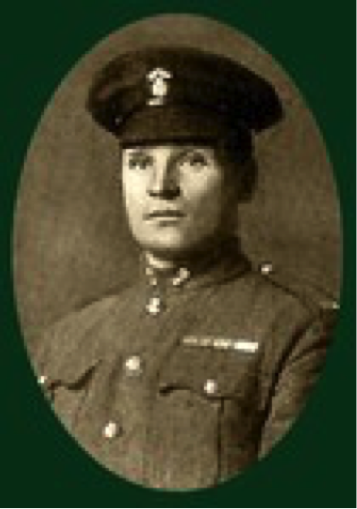 Doyle set the very highest example to all ranks by his courage and total disregard of danger. Company Sergeant-Major Doyle was presented with his Victoria Cross in Buckingham Palace in 1920 and received a warm welcome on his return to New Ross. Company Sergeant-Major Doyle was discharged in July 1920 and joined the IRA becoming an intelligence officer for the mid-Clare brigade in Ennis in the War of Independence. During the Civil War he served with the Free State Army in Waterford, Kilkenny and south Tipperary and was wounded in the left arm in Limerick in early 1923. The Times of London reported that Company Sergeant-Major Doyle was part of an honour guard of Victoria Cross holders at the interment of the Unknown Warrior in Westminster Abbey on November 11, 1920, by which stage he had already joined the IRA. He also attended a Victoria Cross reunion dinner in 1929 in the Royal Gallery of the House of Lords. In 1937, he completed his service with the Permanent Defence Force in the rank of Company Sergeant. His Army record described him as “an excellent NCO, a very good Vickers machine gun and rifle instructor, and someone who could not be replaced without serious inconvenience to the service”. He spent a further year and a half in the Army Reserve. Having spent nine years and five months in the British army, two years in the Old IRA and 15 years and five months in the Permanent Defence Force, he finally departed from the profession of arms on 25 January, 1939. Married with three daughters, employed by Guinness as a security guard, on 20 November 1940, he died of polio in Sir Patrick Dun’s Hospital, aged only 46. Although fighting with and against the British Army, and having spent a considerable time with the Defence Forces, Company Sergeant Doyle decided to be buried in his First World War uniform in the Military Cemetery Grangegorman, Dublin, close to his former comrades. Unlike gravestones of Victoria Cross recipients, his gravestone, erected by his former comrades, instead of having an engraving of the medal, depicts the emblem of The Royal Munster Fusiliers. 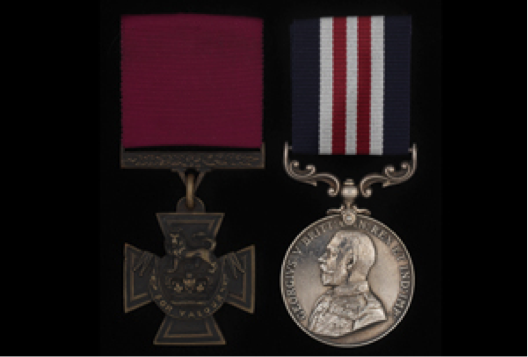 Company Sergeant-Major Doyle’s medals are on display in the Lord Ashcroft Gallery, Imperial War Museum. 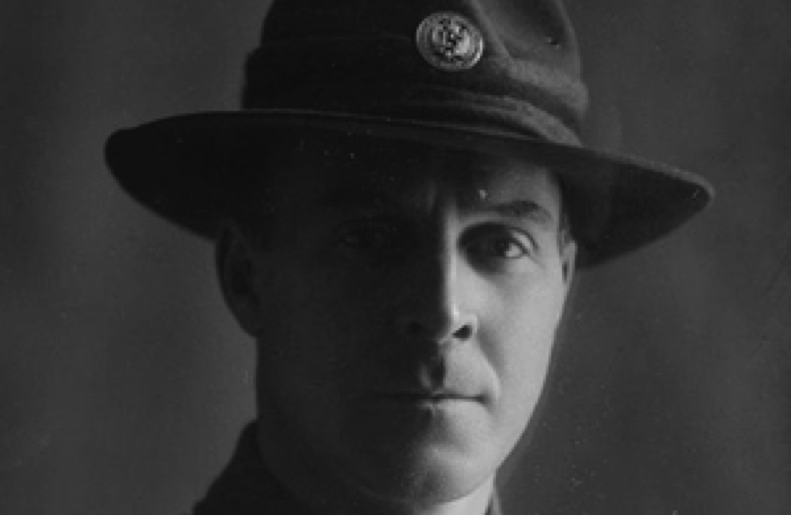 He enlisted in the 1st New Zealand Expeditionary Force and served in Gallipoli and then France. In April 1918, while serving as a Warrant Officer with the 1st New Zealand Field Bakery, he voluntarily relinquished his rank and transferred as a Private in the 2nd Battalion Auckland Infantry Regiment. Private Crichton was serving with the 2nd Battalion, Auckland Infantry Regiment when he was awarded his Victoria Cross during the ‘Hundred Days Offensive’, a series of Allied attacks in the final weeks of the war, on 30 September near Crèvecœur in France. Private Crichton’s platoon was conducting an offensive across the Scheldt River when they came under machine-gun fire. For most conspicuous bravery and devotion to duty when, although wounded in the foot, he continued with the advancing troops despite difficult canal and river obstacles. When his platoon was subsequently forced back by a counterattack he succeeded in carrying a message which involved swimming a river and crossing an area swept by machine-gun fire, subsequently rejoining his platoon. Later he undertook on his own initiative to save a bridge which had been mined, and, though under close fire of machine-guns and snipers, he succeeded in removing the charges, returning with the fuses and detonators. Though suffering from a painful wound he displayed the highest degree of valour and devotion to duty. 16 men from New Zealand received the Victoria Cross, Britain’s highest award for gallantry, during the First World War. Private Crichton received his Victoria Cross from King George on 27 February 1919, at Buckingham Palace. After the war, James Crichton returned to work as a cable splicer in New Zealand. He died in 1961, aged 82, and is buried in the Waikumete Memorial Park Soldiers’ Cemetery, near Auckland. 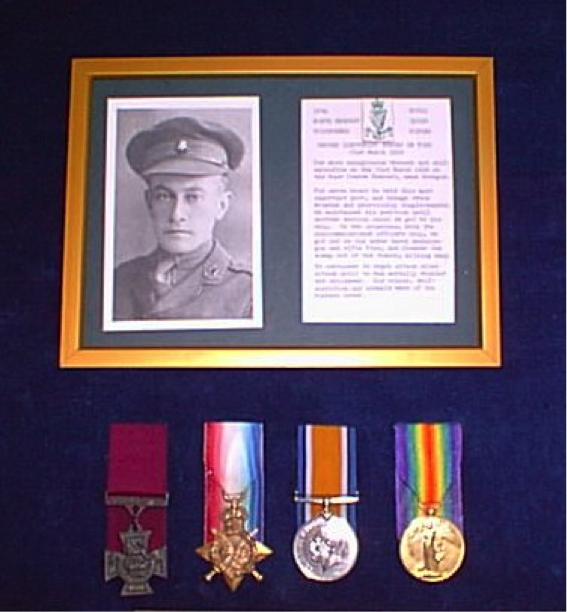 His Victoria Cross, along with his service medals from the Boar War and the First World War, are on display at the Auckland War Memorial Museum. On 15 April 1882, Martin Joseph Moffat was born in Knappah Road, Sligo. He was the son of Martin Moffat, who hailed from Altamount, County Mayo, and Bridget McDonagh. 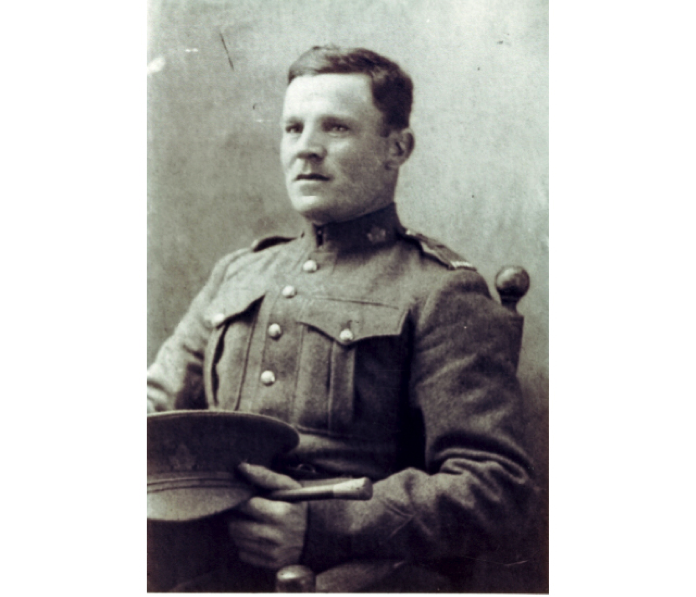 He enlisted in the 6th Battalion, Connaught Rangers, and in December 1915 was deployed to France. In 1918, Private Moffat transferred to the 2nd Battalion, Prince of Wales’s Leinster Regiment, and was involved in action near Ledeghem, Belgium. On 14 October 1918 near Ledeghem, Belgium, Private Moffat was advancing with five others across the open when they suddenly came under heavy rifle fire at close range from a strongly held house. Rushing towards the house through a hail of bullets, Private Moffat threw bombs and then, working to the back of the house, rushed the door, killing two and capturing 30 of the enemy. 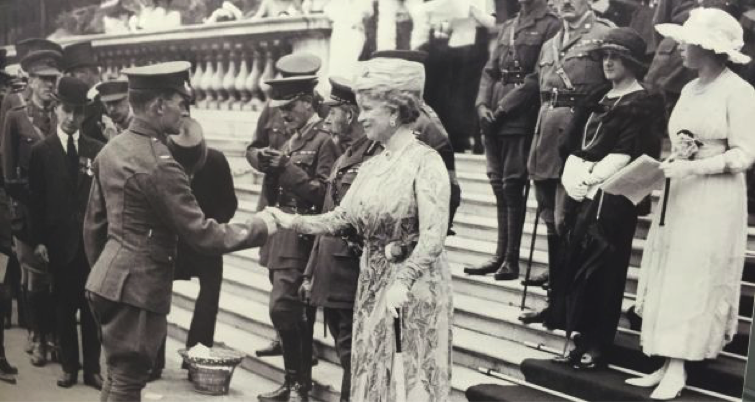 After been presented with his Victoria Cross by King George in Buckingham Palace, Private Moffat arrived home to Sligo to a reception in his honour. Following his demobilisation, Martin returned to Ireland and his native Sligo. He married Annie, and they had a son, Joseph, who tragically died aged three, on 17 September 1933. Tragedy struck again, when on the morning of 05 January 1946, Martin drowned, aged 61, whilst swimming near Sligo. He was buried in the family grave in Sligo Town Cemetery with his son, and later his wife (who died in 1963), and her sister Ellen (died in 1984) were also buried in the same plot. 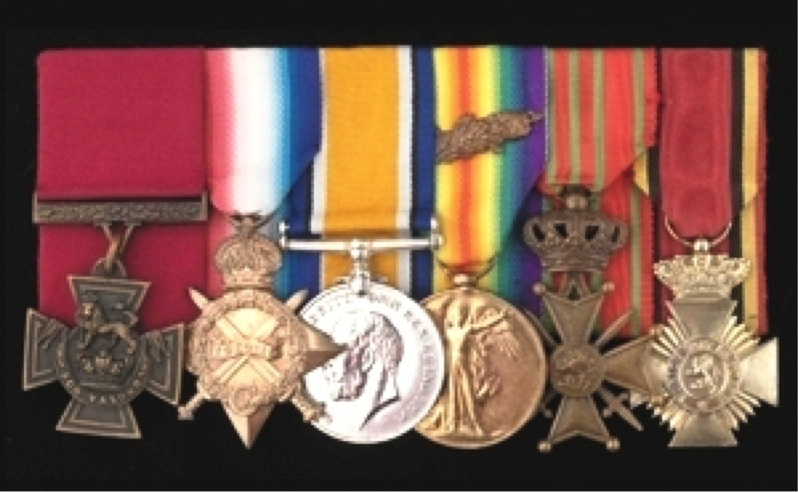 Private Martin’s medals including the Victoria Cross, 1914-15 Star, British War Medal 1914-20, Victory Medal 1914-19 with Mentioned in Despatches Oakleaf, King George VI Coronation Medal 1937, Belgian Croix de Guerre and the Decoration Militaire (Belgium) were purchased at auction at Christie’s, London in 1991 by Michael Ashcroft and are now displayed in the Ashcroft Gallery, Imperial War Museum, London. Copies of his medals and a photograph are on display in the County Museum, Stephen Street, Sligo.